TREATING FUNGAL NAILS OR ATHLETE’S FOOT? PROTECTING FEET AND NAILS AGAINST (RE) INFECTION? Treating or peventing the feet against fungal infection? Mycosan offers a fast, easy and effective solution. Mycosan Fungal Nail has a unique composition and can also be used by diabetics and children from the age of 4. 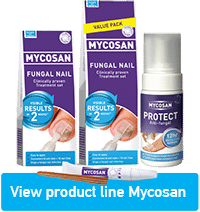 Mycosan Fungal Nail (5ml & 10ml0, Mycosan Athlete’s Foot, Mycosan Foot & Shoe powder and Mycosan Protect Anti-Fungal. *92% of the users during a consumer study saw within 2 weeks an improvement of the nail surface. Visible result in 2 weeks*! 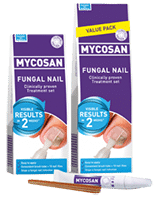 Mycosan Fungal Naill is a complete treatment set, containing a unique serum in a user-friendly tube with brush, 10 nail files for single use and a treatment schedule. Mycosan is proven effective and active against fungi that cause fungal nail. It is an easy and fast solution*. Mycosan Fungal Nail contains has a unique composition. 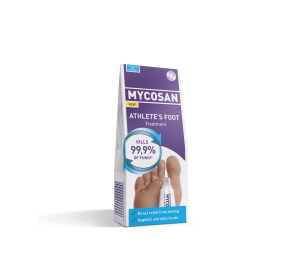 Mycosan Athlete’s Foot treatment is an easy to use and highly effective gel for treating athlete’s foot. 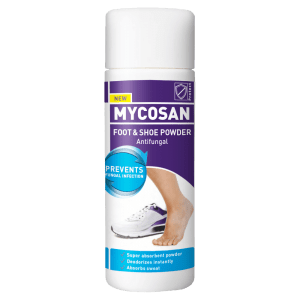 Mycosan Foot & Shoe powder is deisgned for the prevention of fungal infections of the skin and nail of the feet instantly. Mycosan Protect Anti-Fungal is a refreshing foot foam that protects feet for 12 hours against athlete’s foot. 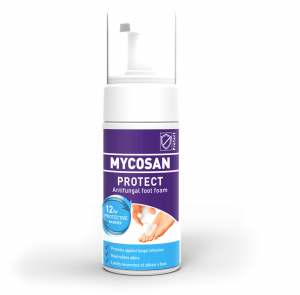 Mycosan Protect Anti-Fungal recovers the health of the skin of the foot and offers protection against a fungal infection by forming a protective film around the feet.